Convicted 22.12.1911 of permitting gaming. Abraham Gowing died Saturday 11th December 1909 following an operation, that morning, to remove a tumour from his neck. He had previously been advised by medical gentlemen to undergo an operation, but always declined. Ultimately he consented, but died of shock after the operation. It was said at the inquest, Monday 13th December, that had he consented earlier he may have surived. George Kew, formerly of the VINE was said to be insolvent at the hearing Monday 21st March 1842. He had however been accused of removing goods in December 1841, prior to his insolvency being announced. He was warned by the Commissioner that if any property, secreted away, should be found, then he would be liable to three years' imprisonment. He was remanded for four months from the date of the vesting order. The smallest pub in Norwich. .... and the last gem....to 2006. 1845 (Magistrates) and in 1856 (Craven) , but at the ALBERT TAVERN in 1846 (Post Office), 1854 (White) and 1858 (Post Office). He is at the PRINCE ALBERT TAVERN in the 1861 census. Mary Daniels is named at the VINE from at least 1864. The 1851 census suggests that John Scrivens (age 64) innkeeper, is at this address and Thomas Daniels is two doors away (Towards Market) and is a 41 year old Tailor. .......and then we get to the GRAPES. 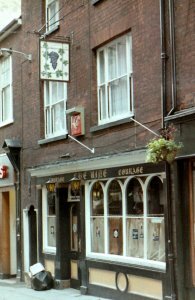 Different licensees are given up to 1854, suggesting 2 separate houses, BUT in 1865 and 1868 Mary Ann Daniels is named at the GRAPES. Was she running two premises? In 1877 a J. Betts is given at the GRAPES - apparently an error for T Betts. House No. 153 on 1845 Magistrates list. 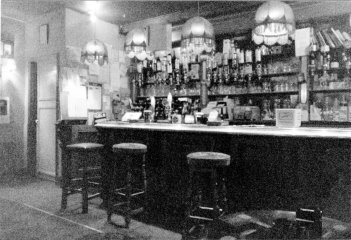 Old bar backing with attractive wood mouldings.